Arizona Down Payment Programs are available through some amazing Non-Profits companies in Arizona. These programs are designed to assist individuals who do not have the money for a down payment to purchase a home or don’t want to wipe out their savings to buy a home. There are multiple Down Payment Programs that a person could qualify for. Down Payment Programs are funded thru Government Grants and are administered through “Licensed Mortgage Companies” or “Approved Lenders” under the program. Certain programs do not have location and income restrictions, its best to talk to an “Approved Lender” to make sure you have the best program for your state and county. To find the right program you would qualify for, all you do need to know: Your Credit Score, The County your purchasing in, and the Purchase Price of the property you want to buy. There are many programs available in Arizona and to just look at one might be a mistake, they all have differences between them. You really have to be fluent in mortgage terms to realize what program fits what box. You will find that programs will vary on Income, Location, Employment, Debt To Income, Amount of loan, Student Loans, Home Value, Credit Score, and even Closing Cost. Best practice is to find a lender that has multiple of these programs and let them show you what program works best for you. There is a Chance to get turned down by one program and you may qualify for another. The Down Payment Programs themselves will NOT talk to you directly about how to get approved, everything goes through an approved lender. The Approved lender is a Local Lender in the community (typically Lives in your state) and knows all these programs and what one would be the best fit for you! First Time Buyers Programs Available! 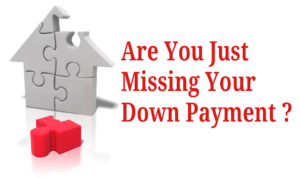 Why Is There A Need For Down Payment Assistance? There are many down payment assistance programs available in all areas of Arizona. The government provides these programs to increase the number of homeowners and create a stable housing market. Because of these programs, the rate of home ownership has increased throughout the state of Arizona. The amount of the down payment assistance grant/gift can vary from county to county in Arizona. The range is between 3% to 5% of the purchase price of the home and maximum down payment assistance in Arizona tops out at $20,000 in assistance. Again Your County and Purchase price along with credit all play factors. The best part about grants/gifts is in most cases they do not have to be repaid.